Autoimmune Conditions | Dr. Melissa Lee ND., RAc. The immune system is quite complex and we are still discovering many things about it. It plays a very important role where it constantly surveys the internal and external environment of our body. Externally, the immune system picks up on foreign invaders like bacteria, viruses, parasites, and allergens. Once detection happens, the immune system isolates them, and preps the body to expel these pathogens in forms like: mucous (runny nose, phlegm), urine, feces, fever and more. Infection is a sign that the body is actively trying to eliminate these foreign invaders. Internally, the immune system is able to detect foreign invaders without mistakenly detecting its own cells for attack. In the process called self-tolerance, our bodies eliminate the cells that self attack. This is the balance that exists in the body: when there is foreign invaders, the immune system acts as the “Pac man” to pick up, digest and expel these invaders. On the other hand, if the immune system starts to attack the body itself, there are mechanisms in place to get rid of these cells. 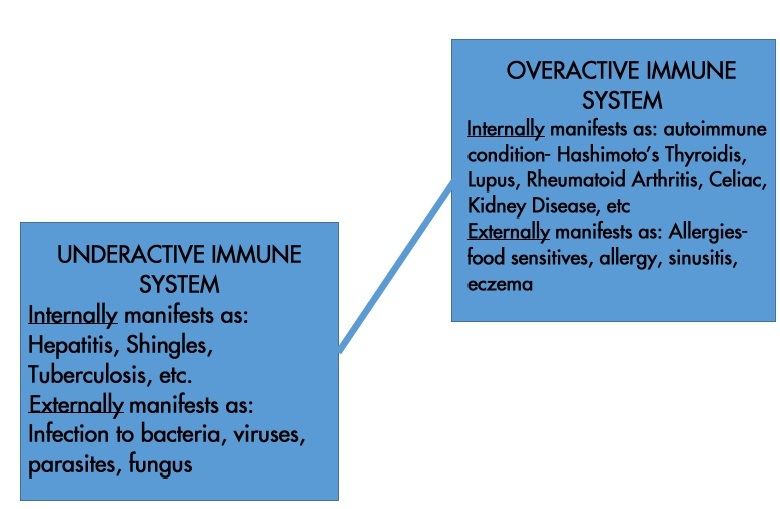 What happens when the immune system because out of balance, it becomes either underactive or overactive. In this situation, dis-ease can manifest. Autoimmunity is defined as an acquired immune reactivity to the self-components. Essentially, the body recognizes itself as target, and it results in the immune system mistakenly attacking and destroying healthy body tissue. Autoimmune diseases are often diagnosed when there has been significant tissue damage that is detectable by markers in the blood, or biopsy. This damage directly affects our organ systems, specifically, our blood, digestive tract, eyes, glands, heart, joints, kidneys, lungs, muscles, nerves, brain, skin and connective tissue. It is suspected that 1 in 5 Canadians are affected by some form of autoimmune disease. In Canada the most common autoimmune diseases include: Lupus (SLE), Rheumatoid Arthritis (RA), Multiple Sclerosis, Chron’s Disease, Sjogren’s Disease, Type I Diabetes, Vitiligo, Grave’s Disease, Hashimoto’s Disease, and Kidney disease. Women are often more effected then men. In such a complex state of dis-ease, health is still achievable. One question we need to ask ourselves in a state of autoimmunity is: are we ready to take care of ourselves? With these conditions, Dr. Lee works to control inflammation, balance and regulate the immune system. Using various botanicals, nutrition, and acupuncture, she works with you to achieve your best health.